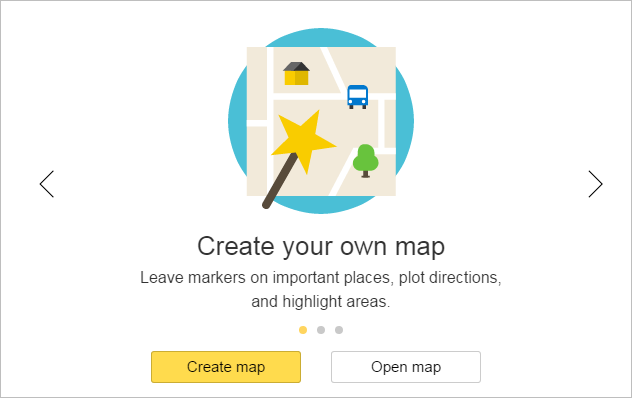 If you've already created one or more maps and want to return to one of them, select it from the list. Every line in the list contains the name and date of the last map update as well as a menu button. Using the menu items, you can create a copy of the map, delete it, or share it (by selecting the Share option in the form that appears and then copying the map link). In the Map Constructor window that appears, you can create items: placemarks, lines, and polygons. You can't add more than 10,000 items to a map (which includes placemarks, lines, and polygons). A line or polygon can not comprise more than 1,000 vertexes. If the number of vertexes that an item has exceeds the maximum, then the item may be simplified automatically (i.e. the excess vertexes are deleted, but in such a way as to maintain the overall appearance of the item). Map is a diagram of map items: roads, buildings, etc. Satellite is a picture of a particular area taken from space. You can also add a traffic layer to your map. Just click Traffic. To disable a mode, you just have to click on it again. A list of items you created can be found under the Items on map list. If you need to edit an item, just click on its name in the list. You can also change the order in which items within a category are displayed by dragging placemarks (or lines, polygons) to the foreground or background. See the Create item section for more information. 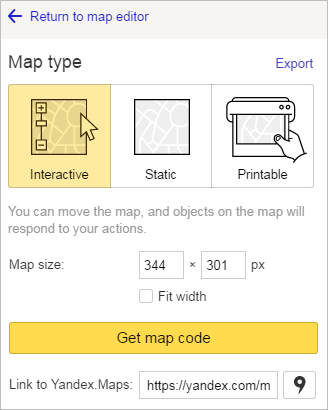 In the Map type toolbar, select your map type and then click Get map code so that you can insert your map on your site, blog or mobile app. You can also copy a link to your map and share it with friends. There are several ways to do this (see the Select map type and get code or link section). 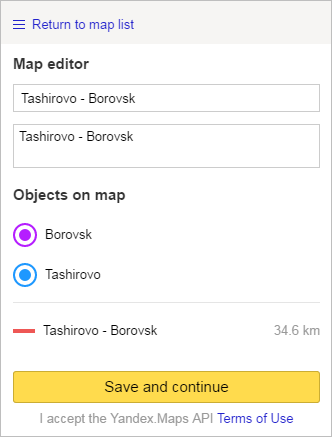 You can also save items from your map to Yandex.Disk using special file types (KML, CSV, GPX or GeoJSON). To return to map-editing mode, click Return to map editor. To go to your maps list, click Go to my saved maps.